The Cumulative Index contains a listing of all surnames found within the Blue Hills Genealogical Society’s indexed archives. This is a great jumping-off point if you’re not sure what we might have about your ancestor. WARNING: This is a LARGE file. There are over 84,000 names in this index, and it will take up to a couple of minutes to load over slow connections. Once the Cumulative Index loads, you can either search manually by scrolling down through the list, or you can use the Search function to type in a Surname you are looking for. To access the Search function, hold the Control Key (Ctrl) and press F. That will bring up the following window. The menu circled in red is where you type the name or word you are searching for. If more than one instance of your surname is available (for example, multiple members of the same family), you can use the up and down arrows alongside the search box to move to the next or preceding search results easily. 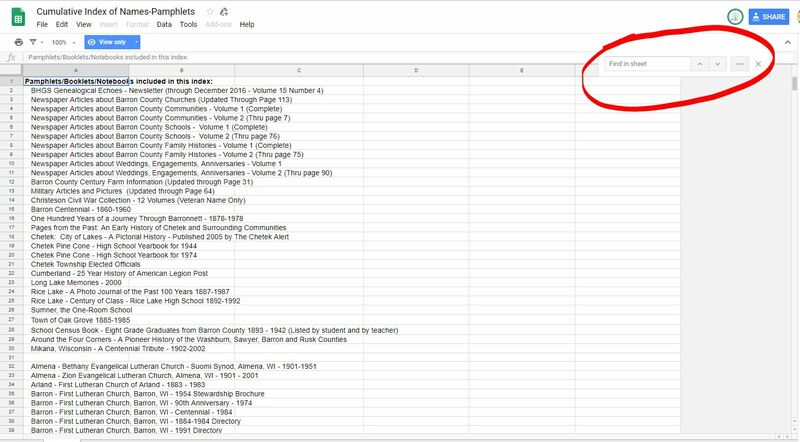 Visitors are not able to edit this sheet (this is shown in the blue button that says “View only”), but you are able to download it or sort it if you wish. Feel free to explore the tools in the main menu bar! Anything not available to visitors is grayed out and not able to be clicked on. Are you having trouble accessing this file? E-mail the webmaster at bluehillsgenealogicalsociety@gmail.com.